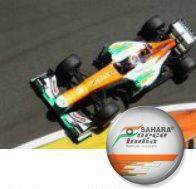 Sahara Force India narrowly missed out on points at Suzuka as Paul Di Resta finished in P11 ahead of Adrian Sutil in P14. Paul Di Resta: "At the start of the race I didn't get a good launch and a few cars came by me, and then we lost out at the first pit stop because the Williams of Bottas jumped us. That compromised the second stint, which is why we went very aggressive with an early second stop to get track position and move ahead of the Williams. The car felt better for the final stint and it looked like we were on course for a point. In the end we were about five laps too short with the tyre life because I couldn't defend from Jenson [Button]. With four races to go we need to take the positives from this weekend and will travel to India determined to get back in the points." Adrian Sutil: "It's been a very tough weekend and starting from the back of the grid made it difficult to get close to the points. In the end I finished P14 and had some good battles, but there was a lot of oversteer in the car and it was not easy to be consistent. The best part of the race was the start because I moved up to P16, but we just didn't have the race pace we needed today and couldn't get the performance from the tyres." Robert Fernley, Deputy Team Principal: "We made no secret of the fact that Suzuka was going to be the most difficult track for us in the second part of the season. So it was no surprise that points were hard to come by today. Paul came close in P11, but his race strategy was hampered in the second stint when he was running behind Bottas. He finally cleared the Williams by pitting early for his second stop, but we were missing the pace to fend off the recovering Button and that cost us the final point. With Adrian it was a similar story as he ran behind Maldonado for much of the race and struggled with tyre performance. So it's been an uphill struggle for us, but we remain upbeat as we head to India for the team's home race. The upcoming tracks should play more to our strengths and give us the opportunity to get back to scoring regular points."